November 1941, the Wehrmacht has ground to a halt outside of Moscow and the relationship between Japan and the US is deteriorating. John Russell, a British journalist with an American passport and long term resident of Berlin, can sense the winds of change. He’s loathed to leave his thirteen year old son or his long term girlfriend, actress Effi Koenen, but it’s clear he needs to try and find a way to out of the country whilst remaining in contact. One prospect is to act as a point of contact between the Americans and the Abwehr. Another is to gather evidence of significant interest to the Allies and, in particular, the communists so that he can use their escape lines. However, just as he’s putting both arrangements in place the Gestapo and SD re-awaken their interest in his presence and activities, potentially jeopardising his plans. Stettin Station is the third book in the John Russell and Effi Koenen series. The strengths of the tale are the characterisation, sense of atmosphere and place, and the historicisation. Russell and Koenen are well realised and rounded characters and they are accompanied by a broad spectrum of nicely penned others, including journalists, administrators, various forms of police, family, friends and other citizens. 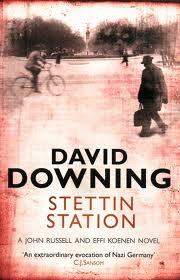 Downing manages to nicely blend the everyday realities and complexities of living in Berlin during the war with the politics and machinations of a police state and his role as a foreign journalist. The result is a story that captures the everydayness of getting on with lives in a state of perpetual background fear, and the tactics of surviving and resisting. Moreover, by utilising real events and occasionally real historical characters, Downing provides a semblance of authenticity. Where the book suffers a little is with regards to the plot. Whilst it is an interesting story the tale seemed largely a transitory one, moving the characters into place for the next instalment rather than having its own self-contained arc and denouement. Moreover, the ending seemed somewhat contrived and didn’t ring true to me. Nonetheless, Stettin Station is a solid addition to a very good series and I look forward to reading the next instalment.